Gentiana acaulis L. Gentiana purpurea, Gentiana pannoica, Gentiana punctata and Gentiana acaulis are smaller European gentians with similar medicinal properties and are used arbitrarily with each other and with Gentiana lutea. Habitat: Gentiana lutea L. belongs to the large plant family Gentianaceae. It prefers altitudes from 2,300-8,000 feet, (700-2400 meters), with shady or sheltered sites on loamy soil. It may be easily cultivated from either seed or by splitting the large root crowns. The underground parts are harvested in the fall, sliced and dried slowly. The drying process develops the odor, color, and taste of this traditional medicinal herb. Gentiana acaulis L. is native to the European Alps, found at elevations of 914-1524 meters. Gentiana scabra commonly grows in the mountain valleys of central China and is the gentian most commonly used today in Traditional Chinese Medicine. Historically Chinese herbalists did not differentiate between the species of gentian and most likely a variety of species were used. Gentian is called lung tan, or dragon’s gall, due to its very bitter taste. 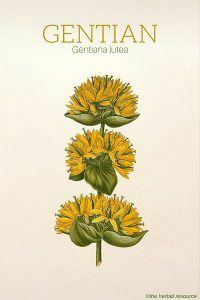 Plant Description: Gentiana lutea L. has a cluster of fragrant orange-yellow flowers, erect stems and smooth oval leaves. It is a perennial that grows to a height of 1.8 meters. The roots and rhizomes are sometimes branched, varying in thickness from 5 to 40 mm and nearly cylindrical. The color ranges from dark brown to light tan; the darker roots appear to have a more pronounced bitter taste. Gentiana acaulis L. is a smaller herb, generally growing only to 10 cm in height with a basal rosette of lance-shaped leaves. Gentiana scabra has vivid blue bell-shaped flowers and the twisted rhizome is white when fresh. When dried, the rhizome is reddish-brown with numerous rootlets. Plant Parts Used: Gentiana lutea L.: dried rhizome and root. Gentiana acaulis L.: whole plant. The bitter taste of gentian is due to bitter iridoid glycosides; primarily gentiopicroside, swertiamarin, amarogentin and gentiopicrin. Gentian contains several alkaloids, predominantly gentian and gentialutine. Additionally, it contains the constituents: xanthones, triterpenes, pectin, tannin, mucilage, and sugar. Many species of gentiana are used in a similar way across widely divergent cultures. 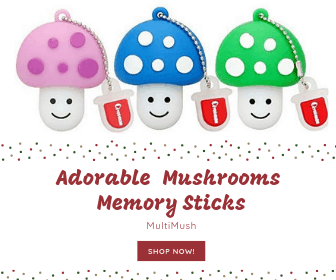 It is found in the Indian Ayurveda herbal medicine, Traditional Chinese Medicine, as well as in European herbal pharmacopeia. It has a long history of use as bitters, used to promote the appetite and digestion by general stimulation of the digestive juices. Gentian, as with all bitters, is important in traditional herbal medicine as a remedy for physical and mental exhaustion. The herb is used as a blood builder, traditionally used convalescence. It is used as a natural herbal treatment for gaining weight, anorexia and exhaustion. 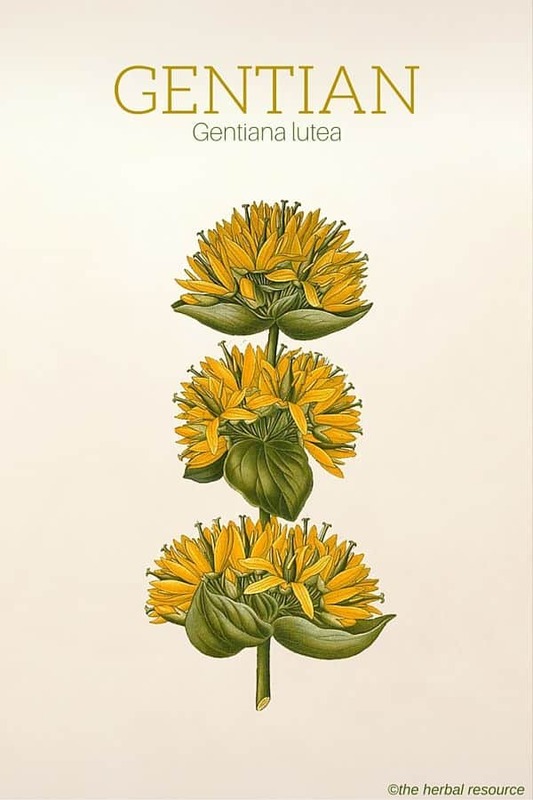 Gentian is believed to strengthen the entire system by stimulating the digestive function as well as the general circulation and the activity of many glands and organs. The herb is used as a liver tonic and to stimulate an insufficient production of gastric juices, bile, and saliva. It is used to alleviate inflammations in the gallbladder. Gentiana scabra, or lung tan in traditional Chinese medicine, has much the same uses as gentian in European herbal tradition. 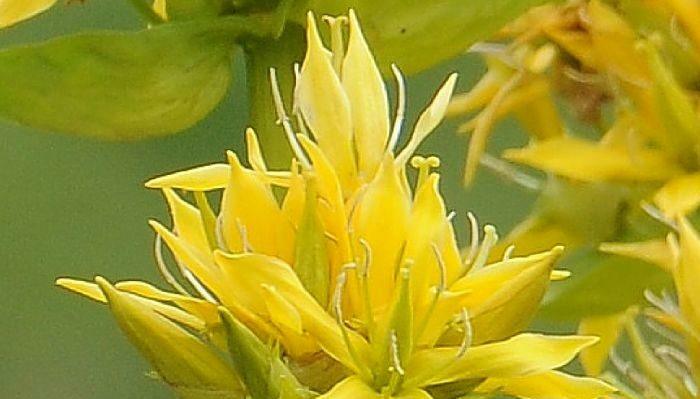 It is used for fevers, rheumatism, toxicity of the bowels, and general debility. It is believed to enhance memory and is used as a liver tonic. Both gentian and stemless gentian are recognized as generally safe by the FDA, and extracts of gentian are used in a variety of anti-smoking products, cosmetics, and foods. It is traditionally used as an herbal treatment for wounds; animal studies have shown it to have a measurable anti-inflammatory and wound-healing effect. The herb is used internally as a remedy for sore throat and arthritic inflammation. It is used in liquors and schnapps and is an important ingredient in Angostura bitters. It was traditionally often used in combination with other digestive stimulants such as ginger and cardamom. Simmer this mixture for one or two hours in a ¾ pint of boiling water. Commercially made tincture can be used or it can be homemade by using the below recipe. Macerate the mixture in one ounce of 100 proof vodka (wine or other spirits may be substituted for vodka). Shake the mixture daily. After two weeks, squeeze out the liquid and filter. Take ½ to 1 teaspoon one-half hour before meals. Gentian should not be used while pregnant, as it may not be well tolerated and has been documented to cause adverse effects. Gentian is contraindicated for individuals with excessive gastric acid secretions, those suffering from heartburn, gastric ulcers, duodenal ulcers, or high blood pressure. Overdose may cause gastric irritation, resulting in nausea and vomiting. Care should be taken if the herb is collected in the wild, as it is easily mistaking for the highly toxic white hellebore (veratrum album L.), which is frequently found growing with gentian. 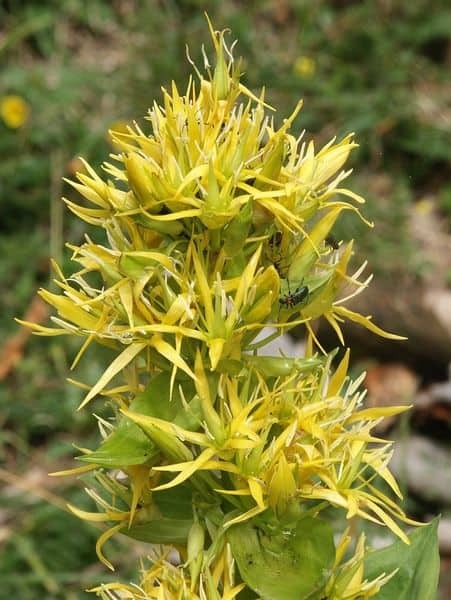 There are reports of acute veratrum alkaloid poisoning has been reported in persons who drank homemade gentian wine that had accidentally been contaminated by white hellebore harvested by those unable to distinguish between the two very similar plants. Belladonna and aconite root, and the rhizomes of orris have also been found mixed with gentian. Commercial powdered root has frequently been found adulterated with ground almond shells and olive stones. Always discuss nutritional supplements and herbs with a doctor or professional healthcare provider in order to be sure that they are not contraindicated for the specific condition, and to avoid adverse interactions with conventional medications and other medicinal herbs. Be sure to research carefully for reputable sources that maintain a high standard for quality.